Here are the courses by grade level of the Ron Paul Curriculum. Click each link for a full description of the course. Introduction to Phonics — Taught by Cheryl Page. Each lesson is video-based, with instructions for the mother on how to teach to her child every aspect of basic phonics. All the worksheets needed are provided as printable PDFs. This entire course is free. 1st Grade Phonics/Reading — Taught by Mrs. Barbara Pickard, M.Ed. You get 40 lessons free. 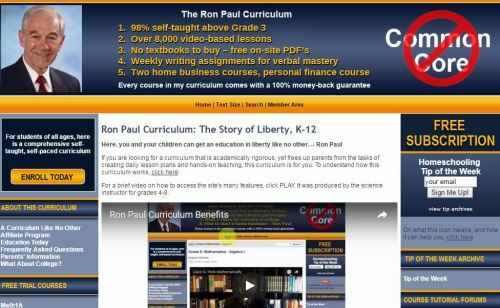 These free introductory videos let you test the Ron Paul Curriculum’s reading program, which is a 3-year program. Mathematics 1 — Taught by Paul Ramirez. Grade 1 math covers the first 37 lessons of Ray’s New Primary Arithmetic. This video will give you a brief overview of what Math Grade 1 will cover. The course runs 36 weeks, 180 lessons in all. The first 40 lessons are free. 2nd Grade Reading — Taught by Hannah Livingston. The first five lessons are free. Mathematics 2 — Taught by Paul Ramirez. Math 2 covers the rest of Ray’s New Primary Arithmetic: Lessons 38-89. Anyone can preview the first five lessons free of charge. 3rd Grade Reading — Taught by Jennifer Rauch. The first five lessons are free. Mathematics 3 – Taught by Paul Ramirez. The textbook used is Ray’s New Intellectual Arithmetic, the second volume in the Ray’s Arithmetic series. Mathematics Grade 3 covers the first 26 lessons. Anyone can preview the first five lessons free of charge. English — Taught by Kaliste Fish. This course combines three different learning methods — videos, reading, writing — to create an effective learning atmosphere. Click here to view a syllabus of the material covered. Members can survey the first five lessons in this class free of charge. Mathematics — Taught by Paul Ramirez. Mathematics 4 finishes what Mathematics 3 started — the rest of the lessons contained in Ray’s New intellectual Arithmetic (lessons 20-80). The first five lessons of the course are free. Science — Taught by Daniel A. Dignan. Topics include: Insects & Spiders, Birds, Fish & Sea Monsters, Reptile & Amphibians, Lions and Tigers and Bears!. Members can preview five lessons for free. History — Taught by John Livingston. This course begins a study of the history of inventions, starting with the Egyptian pyramids. It proceeds in chronological order and helps develop a sense of how inventions influenced history. Each lesson examines one invention or an inventor. It explores what the world looked like before the invention came along, how it was discovered, how it was marketed (why it caught on), and what its impact on history was. You can survey the first five lessons in this class free of charge. English — Taught by Kaliste Fish. This 5th Grade English class builds on the grammar and punctuation lessons taught in the corresponding 4th grade class. This course combines three different learning methods–videos, reading, and writing–to create an effective learning atmosphere. Click here to view a syllabus of the material covered. You can survey the first five lessons in this class free of charge. Mathematics — Taught by Kevin Poff. In this 5th grade arithmetic course you will learn the basics of arithmetic as laid out in Ray’s Practical Arithmetic. Members can see the first five lessons for free. Science — Taught by Daniel A. Dignan. Topics covered: Food Science & Chef School, Art School, Space Exploration & Rocket Science, Photography & Electronics, Storytelling, Filmmaking. Members can preview five lessons for free. History — Taught by John Livingston. This course resumes a study of the history of inventions, starting around 1800 AD where 4th grade history leaves off. It proceeds in chronological order up to the modern day, and it helps develop a sense of how inventions influenced history. Each lesson examines one invention or an inventor. It explores what the world looked like before the invention came along, how it was discovered, how it was marketed, and what its impact on history was. You can survey the first five lessons free of charge. English — Taught by Bradley Fish, Jr. The syllabus allows time for students to enjoy reading literature by alternating the focus between reading and writing throughout the year. Your student will also be able to see a systematic growth in vocabulary, grammar, and writing skills. You can survey the first five lessons free of charge. History — Taught by Bradley Fish, Jr. Beginning with Moses and ending with the fall of the Roman Empire, this history class is designed to instruct ancient history to middle school students. You can survey the first five lessons free of charge. Mathematics — Taught by Benjamin Richards. In 6th grade, you will already be learning the basic concepts not only of arithmetic, but also of algebra, geometry, and logic. You will learn such topics as fractions, decimals, percents, Roman numerals, line numbers, points on a graph, angles, basic geometric solids, negative numbers, exponents, units and measurement, interest rates, simple probability, and much more. Here is the full list of 180 lessons. You can survey the first five lessons for free. Science — Taught by Daniel A. Dignan. This course covers the following topics: Geology, Plant Science, Gardening, Conservation, Weather, Landscape Architecture. You can survey the first five lessons for free. English — Taught by Bradley Fish, Jr. The 7th English class combines literature, writing, grammar, vocabulary and literature analysis into one master course. The literature in the 7th grade was chosen to reinforce the cultural and historical developments that are being studied in the 7th grade history class. You can survey the first five lessons free of charge. History — Taught by Bradley Fish, Jr. From the Vikings in the Middle Ages to the famous explorers who started colonies and civilizations throughout all the continents, this history class is full of exciting events. This year also addresses some of the important cultural developments that took place as it covers the Protestant Reformation, the Renaissance, and other important developments. The course begins in 500 AD with the end of the Roman Empire, and continues through 1749 and the development of the British colonies in America. You can survey the first five lessons free of charge. Mathematics — Taught by Benjamin Richards. Grade 7 mathematics further develops your abilities in the areas of arithmetic, algebra, geometry and logic. You will not simply learn how to pass tests. You will learn to think mathematically: to understand the structure and beauty of the mathematical world and to be able to use that understanding to solve real-world problems. Here is the full list of 180 lessons. You can survey the first five lessons for free. Science — Taught by Daniel A. Dignan. This course covers: 1) Learn how to be a ham radio operator; 2) Robotics; 3) Personal Health & Fitness; 4) Learn how to save lives in an emergency; 5) Backpacking; 6) Camping. You can survey the first five lessons for free. English — Taught by Bradley Fish. The 8th Grade English class combines organizational skills, research habits, essay writing, and much more into a single writing course. The literature which accompanies the video lessons and writing assignments was chosen to reinforce the techniques of good writing that are being studied in the class. You can survey the first five lessons for free. History — Taught by Bradley Fish, Jr. Beginning with the French and Indian War and following the development of the United States all the way up to present times, this history class is full of exciting events. This year also addresses some of the important cultural and political developments that took place in both North America and Europe between 1750 and 2010. You can survey the first five lessons for free. Mathematics: Algebra I — Taught by Benjamin Richards. This is a first year algebra course which provides you with the necessary mathematical skills to succeed in advanced high school mathematics. Here is the lesson list. You can survey the first five lessons for free. Science — Taught by Daniel A. Dignan. This course 1) helps students build their own YouTube channel, step-by-step; 2) will teach you how search and rescue (SAR) and the Incident Command System (ICS) work in the United States; 3) will teach you water rescue methods and safety techniques; 4) will teach you about the known universe and how to become an astronomer; 5) will teach you about atoms (basic building blocks of matter) and Atomic Theory; electron orbitals and configurations; in depth study of the Periodic Table of Elements; chemical polarity, chemical and intermolecular bonding (forces of attraction), chemical reactions and how to balance chemical equations; DNA and biochemistry; the chemical processes that enable fireworks and other processes to react will be illustrated and detailed in special lab sessions; 6) covers computer engineering and computer science basics; and 7) cover the basics of engineering in order to spark interest in this field early. You can survey the first five lessons for free. Personal Finance — Taught by Timothy Terrell. Teens do not have confidence in their ability to handle their finances and their time, and this course is directed at changing that. Instead of working without goals, students will learn how to develop goals and achieve them. Instead of habitually over-spending, students will learn the techniques of managing their finances with longer-term goals. Instead of thinking about how to spend resources they did not earn, students will learn how to imaginatively create wealth. Instead of joining the 30% percent of student loan borrowers who are delinquent on their payments, students will learn to avoid debt traps. You can survey the first five lessons for free. Using WordPress.com — This course is free for members and covers the basics. Every student, grades 6-12, should have a blog site. The blog site is for posting weekly essays, but it is also training for the courses in setting up a small business. Mathematics 9 — Taught by Benjamin Richards. Grade 9 mathematics is a second-year algebra course. In 9th grade, your student will master college level algebra including functions; complex numbers; matrices and determinants; systems of equations and inequalities; polynomial, rational, exponential and logarithmic functions; conic sections; sequences and series; and counting and probability. Realistic problems provide your child with proficiency in applying algebraic concepts. After successfully completing 9th grade mathematics, your student will be prepared to pass the CLEP College Algebra examination. View the first five lessons for free. Science 1 — Taught by John Hamilton. This is a course in physical science. Click here to see a complete list of the lessons in the course. Members can survey five sample lessons for free. English 1: Classic Autobiographies — Taught by Gary North. The Ron Paul Curriculum is dedicated to teaching you how to write. Every week, in every humanities and social science class, you must write a paper. There are very few high schools that require this of their students. The RPC requires it, because they are going to do whatever it takes to give you the opportunity to gain the skill of fast, effective writing. In English 1, you are going to read autobiographies. These autobiographies will be your training ground for writing your own autobiography. You can review the first five lessons free of charge. Public Speaking — Taught by Bradley Fish, Jr. In this class students will learn how to write and present a successful speech. The course includes: watching effective speeches from some of today’s best presenters and analyzing their strengths and weaknesses, learning how to get from a speech topic to a well-written speech, and pointers on how to deliver any speech effectively. Based on the programs used by Toastmasters International, a widely recognized community organization, this speech class will help any student work through the fear of public speaking and become a confident communicator. You can survey the first five lessons for free. Business I: Introduction to Business — Taught by Gary North. This course is designed as a ninth-grade course, but any high school student can benefit from it. Dr. North teaches students the basics of business: goal-setting, time-management, salesmanship, business ethics, business theory, direct-response copywriting — the key skill that almost no business owners possess — and how to set up a business for $100. This course is crucial for the Business II course, which takes students through the business-launch process. By the end of the 10th grade, a student who has taken both courses ought to have a profitable business — one that should generate a middle-class income by the time the student is 21. You can review the first five lessons free of charge. Mathematics 10 — Taught by Dave Paulus. The goal of this course is to teach you geometry in a way that is easy to understand. You will learn geometry through condensed and easy to follow lessons. The course avoids the traditional frustrations experienced by students through down-to-earth explanations in familiar terms, and it walks students through proofs step-by-step. Geometry is important in engineering and architecture as well as graphic design, fashion design, astronomy, optics, radiography, physical therapy, and many more fields. This high school math course emphasizes higher order thinking skills, and uses practical, real-life examples to teach the material. At the successful completion of this course, students will be ready to move on to pre-Calculus. The first five lessons are free. Biology — Taught by Jacob Bear. Unlike any mainstream high school biology class, this course incorporates research articles written by scientists who have done groundbreaking work in the lab and field. This course was designed with the CLEP and the Advanced Placement Biology exam in mind. Members can survey the first five lessons free of charge. English 2: Western Literature I — Taught by Gary North. This is a course in the history of Western literature from the Hebrews to the Renaissance. It is designed to be complementary to the course on the history of Western civilization, also from the Hebrews to the Renaissance. Both courses end in 1492. For a list of the materials covered, click here. You can survey the first five lessons free of charge. Western Civilization I — Taught by Tom Woods. This 10th-grade course follows the history of the Western world, beginning with the Hebrews and continuing through classical Greece and Rome, the rise and spread of Christianity, the role of the Germanic peoples, the cathedrals and universities of the High Middle Ages, and concluding with the Renaissance and the Age of Discovery (up to 1492). And of course we’ll be tracing the history of Western liberty — political and economic — as well. You can survey five sample lessons for free. Business II: Launch Your Business — Taught by Richard Emmons. This course is designed for tenth-graders yet any high school student can benefit from it. This course complements the lessons taught in the Business I: Introduction to Business course. If you’re a senior in high school, it is recommended you take both courses this year. There are three main objectives of the Business II course. You will: 1. Learn about the world of business and online business opportunities; 2. Develop valuable business skills including website development, graphic design, copywriting and eBook publishing; and 3. Plan and launch an online business which can generate a middle class income in 5 years. The Business II course consists of six sections of six weeks each — 30 lessons per section. You can watch the first five lessons free of charge. Mathematics 11 — Taught by David Paulus. The goal of this course is to teach you advanced mathematical concepts in a way that is easy to understand and to prepare you for calculus. You will learn precalculus through condensed and easy to follow lessons. This course focuses on advanced algebra and trigonometry. It also introduces basic calculus. The first five lessons are free. Chemistry — Taught by Kevin Poff. The course is split up into four parts: 1) Basics of chemistry: what is chemistry, measurement, the atom, naming compounds, stoichiometry, gases, etc. ; 2) Atomic and molecular structure: quantum theory, electron configurations, periodicity, bonding, etc. ; 3) Review of basic chemistry concepts; 4) Topics that one would expect to encounter in a second semester college level chemistry course. The chemistry material covered in this course, if mastered, would be enough to pass the chemistry CLEP exam. However, if that’s not enough, a chemistry CLEP cram course is included at the end of the chemistry course to help you prepare to take and pass the CLEP exam. Members can see the first five lessons for free. English 3: Western Literature II — Taught by Gary North. This is a course in the history of Western literature from the Reformation to modern times. It is designed to be complementary to the course on the history of Western civilization. Both courses begin in 1493. Dr. North selected the literature in order to illustrate the fundamental religious, philosophical, moral, and in some cases political outlook of each geographical region and each time period. He did this in order to help reinforce the Western Civilization course. On the other hand, your familiarity with the literature will make it much easier for you to understand the religious, philosophical, moral, and political outlook of each geographical region in each time period. The courses reinforce each other. For a list of the materials covered, click here. You can review the first five lessons free of charge. Western Civilization II — Taught by Tom Woods. This course continues where Western Civilization to 1492 left off. You will gain the advantage of a second full year of Western civilization, getting to know the personalities and events that created the modern world. This course will familiarize you with all the major schools of political thought in the modern world: liberalism, conservatism, libertarianism, socialism, Marxism, nationalism, nihilism, naturalism, existentialism, and more. It will make you a stronger writer, as you’ll be writing regularly. Course topics include the Protestant Reformation, wars of religion, absolutism, constitutionalism, the Scientific Revolution, the English Civil War, the Enlightenment, the Industrial Revolution, the French Revolution, Napoleon, liberalism, conservatism, socialism, naturalism, Marxism, nationalism, modernism, world wars, the Russian Revolution and communism, the rise of fascism, the Great Depression, the Cold War, and more. There are five free sample lessons. Government 1A — Taught by Gary North. The first five lessons are free. Government 1B — Taught by Tom Woods. There are five free sample lessons. Physics — Taught by John Hamilton, a former university instructor in physics and physical science, who now teaches university-level engineering courses. Click here to see a complete list of the lessons in the course so you can see what topics are covered. There are five free sample lessons. American History — Taught by Gary North. This course requires students to read and analyze primary source documents. It requires them to read recent conventional opinions on historical figures, inventions, and events. It requires them to listen to the instructor’s assessments of chronological developments in these areas: politics, law, economic history, and religious history. They must also look at maps. This course should be taken at the same time as the English 4 course. Week by week, the materials parallel each other chronologically. The first five lessons are free. For the course’s topics, lesson by lesson, click here. English 4: American Literature — Taught by Gary North. This course is historical, as were English 2 and 3. It begins with translations of Spanish literature of North America in the mid-16th century. Then it moves to Jamestown and New England in the 17th century. It ends in the early 21st century. The first five lessons are free. For a list of materials covered, click here. Economics — Taught by Gary North. Texts used: Robert Murphy, Lessons for the Young Economist; Murray Rothbard, What Has Government Done to Our Money? ; Gary North, Honest Money; Gary North, Mises on Money; Henry Hazlitt, Economics in One Lesson; F. A. Hayek, The Road to Serfdom; Leonard E. Read, I, Pencil; Ludwig von Mises, Economic Policy; Mises, Anti-Capitalist Mentality; Mises, Profit and Loss; Mises, Bureaucracy. The first five lessons are free. Calculus — Taught by Som Mathur. Upon successful completion of this course, students may take the AP calculus exam or the calculus CLEP exam. The student will be able to move on to a number of college-level math courses above calculus. The first five lessons are free. You can order a Ron Paul Curriculum course here. I can recommend all these courses except I would not be using formal math or formal grammar with children younger than age ten. This entry was posted on Saturday, November 11th, 2017 at 8:31 pm	and is filed under Ron Paul Curriculum. You can follow any responses to this entry through the RSS 2.0 feed. Both comments and pings are currently closed.